Although there is an increase in solid-state drives, magnetic storage devices such as magnetic tapes and traditional hard drives are still highly common. However, due to the increase in data-storage requirements at a rate of nearly 15 million gigabytes per day, researchers are looking for alternative storage devices. One among the prospective alternatives are single-atom magnets—storage devices that consist of individual atoms stuck, or “adsorbed,” on a surface, where each atom can store a single bit of data that can be written and read with the help of quantum mechanics. Moreover, since atoms are small enough to be packed together closely, single-atom storage devices assure huge data capacities. However, despite the fact that they are no longer science fiction, single-atom magnets are still only at the research level, with various basic obstacles to be overcome before their implementation into commercial devices. EPFL has been the pioneer in this field, overcoming the problem of magnetic remanence, and demonstrating that it is possible to use single-atom magnets to read and write data. In a new research report in the Physical Review Letters journal, physicists from EPFL’s Institute of Physics have employed the technique of scanning tunneling microscopy to exhibit the stability of a magnet including a single atom of holmium, an element they have been studying for many years. Single-atom magnets offer an interesting perspective because quantum mechanics may offer shortcuts across their stability barriers that we could exploit in the future. This would be the last piece of the puzzle to atomic data recording . The researchers exposed the atom to severe conditions that normally de-magnetize single-atom magnets, such as high magnetic fields and temperature, all of which would be perilous to future storage devices. The researchers used a scanning tunneling microscope, which has the ability to “see” atoms on surfaces, and discovered that the holmium atoms were able to retain their magnetization in a magnetic field exceeding 8 T, which is close to the strength of magnets used in the Large Hadron Collider. The authors report this as “record-breaking coercivity,” a term that defines the potential of a magnet to endure an external magnetic field without being demagnetized. Then, they increased the heat: the scientists exposed a series of Holmium single-atom magnets to temperatures of up to 45 K, or −233.15 °C, which, for single atoms, is similar to being in a sauna. 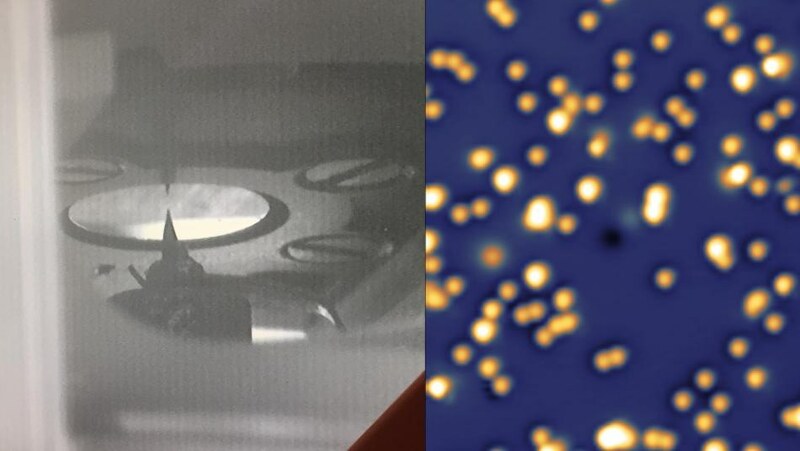 The Holmium single-atom magnets were stable up to a temperature of 35 K. Only at about 45 K, the magnets started to automatically align themselves according to the applied magnetic field. This indicated that they had the ability to endure comparatively high-temperature perturbations and might open the door for operating single-atom magnets at more commercially viable temperatures. “Research in the miniaturization of magnetic bits has focused heavily on magnetic bistability,” stated Natterer. "We have demonstrated that the smallest bits can indeed be extremely stable, but next we need to learn how to write information to those bits more effectively to overcome the magnetic ‘trilemma’ of magnetic recording: stability, writability, and signal-to-noise ratio."